2014.6.14 | James Barr. Bible and Interpretation: The Collected Essays of James Barr. 3 volumes. Edited by John Barton. Oxford: Oxford University Press, 2013-2014. 1985 pages (HB). ISBN 9780198261926. Reviewed by Garrick V. Allen, University of St Andrews. Many thanks to Oxford University Press for providing a review copy. 2014.5.12 | Merrill, Eugene H., Mark F. Rooker, and Michael A. Grisanti. 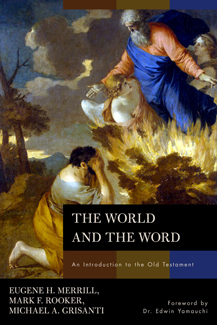 The World and the Word: An Introduction to the Old Testament. Nashville, TN: B&H Academic, 2011. pp. xviii + 618. ISBN: 978-0-8054-4031-7. Many thanks to B&H Academic for providing a review copy. 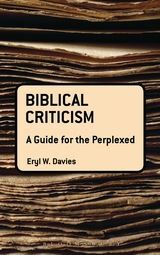 2014.3.6 | Davies, Eryl W. Biblical Criticism: A Guide for the Perplexed. London: Bloomsbury, 2013. pp. ix + 165. ISBN: 978-0-567-01306-4. Biblical Criticism: A Guide for the Perplexed, by Eryl W. Davies, sets out to be an introduction to four of the most prominent and representative post-modernist hermeneutical methods used in biblical studies. It is a quick read (the body is just over 120 pages) that is well-documented and has a very useful bibliography (40+ pages of end matter). Davies’ writing is easy to follow and can be read very rapidly without a significant loss in comprehension, which is very appropriate (and welcome) in primer on methodologies like this. The book consists of an introduction, four chapters (each dedicated to one method), and a conclusion. Davies chooses for his discussion four contemporary hermeneutical methods that have become prominent in contemporary biblical studies: reader-response criticism, feminist biblical criticism, ideological criticism, and post-colonial criticism. Bible and Interpretation: The Collected Essays of James Barr. Volume II: Biblical Studies. 2014.1.2 | Barton, John, ed. Bible and Interpretation: The Collected Essays of James Barr. Volume II: Biblical Studies. (Oxford: Oxford University Press, 2013. pp. i-xii + 619. ISBN: 978-0-19-969289-7). Review by Kurtis Peters, University of Edinburgh. It is no mere flattery to say that this second instalment in Barton’s collection of essays by James Barr is an invaluable addition to any biblical scholar’s library, particularly those in Hebrew Bible/Old Testament. James Barr, the prolific writer and frequent formidable adversary, deserved for his writing to be made readily available to as wide an audience as possible. This is what Barton has achieved. 2012.06.12 | Thomas B. Dozeman, Thomas Römer, and Konrad Schmid, eds. Pentateuch, Hexateuch, or Enneateuch? : Identifying Literary Works in Genesis through Kings. Ancient Israel and its Literature 8. Atlanta: SBL, 2011. x + 313 pages. $39.95. ISBN: 9781589835429. RBECS would like to thank SBL for kindly providing us with a review copy. This is a report on a paper presented by Dr. James Carleton Paget, Senior Lecturer in New Testament Studies, and Fellow and tutor of Peterhouse, at the New Testament Seminar, Cambridge, 21 February 2012. The list of forthcoming papers in the New Testament Seminar at Cambridge can be found here. RBECS is also on facebook, here. Everyone familiar with the work of Dr. James Carleton Paget is aware of his formidable grasp of the history of biblical interpretation in general, and the 19th century biblical scholarship in particular. Therefore, it was a real treat to hear him present on this particular topic at the Senior NT seminar at the Faculty of Divinity in Cambridge. What follows is a brief reflection on the main issues raised by Dr. Carleton Paget, whose paper covered an incredible breadth of information with, I should add, his typical eloquence and unparalleled sense of humour.